I always get slightly excited when I see that I have email, so you can imagine how much more excited I was when I was asked to review this book. “Katherine Howard: A New History” is the first book by young Tudor Historian Conor Byrne. Katherine is often portrayed as the vapid teenaged fifth wife of the indomitable Henry VIII of England. Her time as Queen was cut short, and her life ended with the stroke of the axe, after her alleged infidelity. Modern day TV and movies show her as just a girl who wanted nothing more than to “party” and have fun, unconcerned for anything but herself, to the point of having an affair with one of Henry’s most trusted courtiers. Like many people misaligned from this time period, I can’t help but wonder… How much of that is true, and how much is made up? While we will never be able to answer many of the questions we have about Katherine, Mr. Byrne has gone to great lengths to make us rethink our positions. By referencing a wide variety of sources, the writer seeks to repaint the image of Katherine from that of the silly girl who was in over her head and just looking for a good time, to that of a young woman, abused throughout her early life, and used as a pawn by her status-seeking family. Mr. Byrne sets the stage for Katherine’s rise to fame by starting with the politics of the Henrician court, and how after the tumultuous reign of her cousin, Anne Boleyn, the Howard family looked for a way to once again emerge as the top dogs in the palace. The author starts before Katherine’s birth, describing the world she was born into. He tells us of the proud Howard family, humbled by the scandal of Anne Boleyn’s execution, because of her Howard lineage. The noble family sought to gain the King’s ear and trust again, and thrust Katherine forward as a means to do just that. Mr. Byrne believes that Katherine was the true victim of her story, as a young woman who was used by ne’er do well men for her entire life. Her life was one of continued sexual abuse by the likes Henry Manox, Francis Dereham, and Thomas Culpeper. His further analysis even looks into portraits of Katherine and their identifications, and re-examines her reign, pointing to evidence that shows she was not a frivolous party girl, but took her duties as Queen seriously. If you are a tried and true Tudor-holic, I highly recommend this book. It’s chock-full of details, and Mr. Byrne does his absolute best to rehabilitate the reputation of the ill-fated consort. I always enjoy new perspectives of historical figures, so for me, this was a pleasure to read, and it definitely turned what I thought I knew of Katherine on its side. 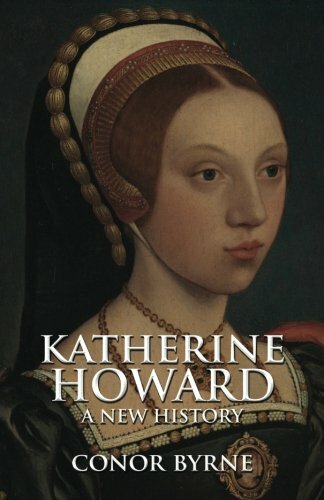 “Katherine Howard: A New History” by Conor Byrne is available on Amazon US and UK in both Kindle and Paperback formats. You can follow the authors blog here.